Maybe the boat is offered for sale. She still needs some love and upgrades. I am starting with the bottom. After that, we are going to refinish some interior surfaces and maybe, just maybe, upgrade a few pieces of hardware on deck. Port side of the hull after paint stripping and the Winter of 2015. The grey is an epoxy barrier coat with some left over bottom paint. Starboard side showing the effects of sanding with 60 grit. The residual bottom paint sands off quickly revealing epoxy and micro balloons layers. 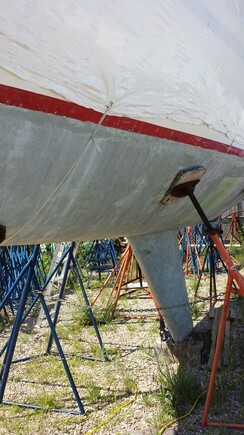 The keel shows signs of having been attacked by a disc sander. Many hollows! Last Fall, I stripped the bottom paint with a non toxic paint remover that worked fairly well. During the Winter, which was brutal, the surface dried out was in perfect condition for a vigorous sanding. In sanding the surface, I noticed may past efforts to fair and smooth the underwater surfaces. Layers of epoxy barrier coat and micro balloon fairing materials are under the old bottom paint. I am down to an almost fair condition. 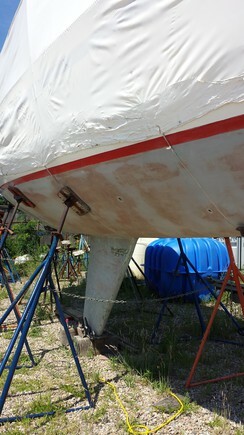 The keel is a bit less fair than the hull so some more serious work has to be done there. Thanks to the guys at Harwich Port Boat Yard for their support. Averisera is at their Queen Anne Road yard. Thanks to Jamestown Distributors for some materials and technical advice. Maybe we'll launch in time for a September sail?